Back in May, I attended Book Expo America (BEA). When I got home, I recapped all the adventures I had during my trip (Pt. I | Pt. II) and the all the books I was able to bring home. I had an amazing time and enjoyed every minute of my time in New York! Attending BEA had been on my bookish bucket list, so I was thrilled to go. Someone asked me recently if I would go again, and I was kind of surprised when I thought about my answer. BEA was a blast, but it's definitely not a cheap trip. The hotel, transportation, food... it all adds up. On one hand, it's worth it for the opportunity to finally meet some of the bloggers I've gotten to know online. But BEA isn't just about blogging buddies, right? It's supposed to be about the books! I've read a lot of BEA recaps written immediately after the event, but I started wondering if anyone ever reflected on it a few months later. What did I do with all the books from BEA? 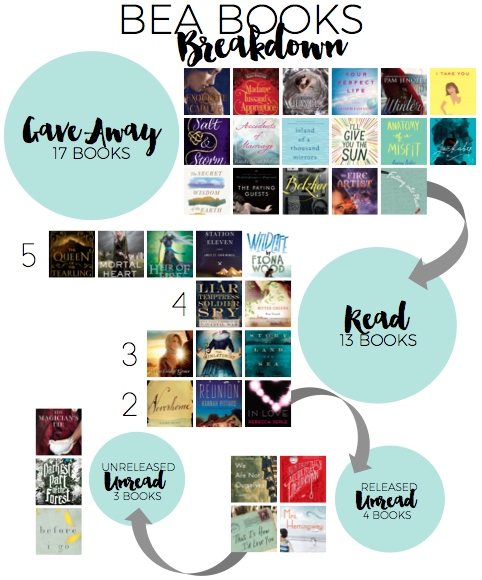 I had my suspicions, but I wanted to actually chart what happened with the books I got from BEA. 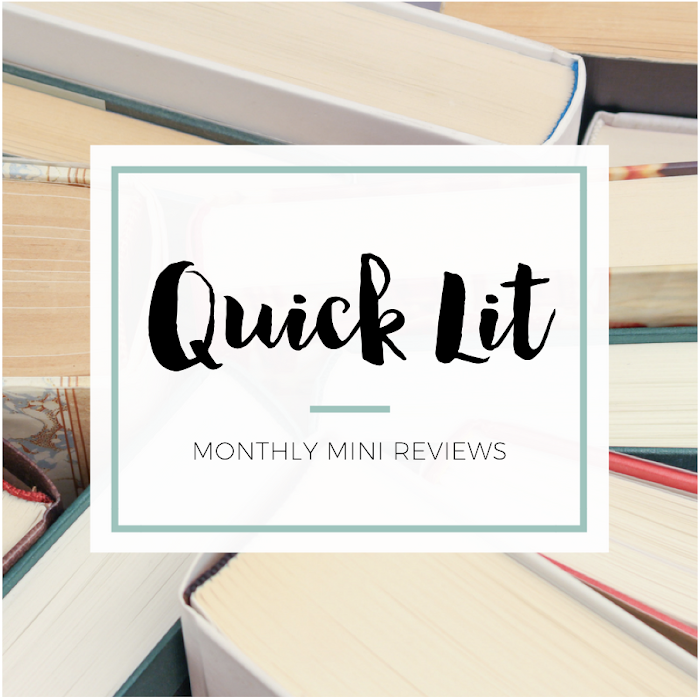 Did I find a ton of new favorite books or authors? Did all that waiting in line pay off? How did the ARCs I brought home impact my reading choices? Did I devour all those upcoming books... or did they languish on my TBR? One of the most challenging things about BEA is deciding what books you want to grab. I'd done a lot of research beforehand and made myself a list of titles that interested me. Some were books from authors I'd read previously, some had been on my wishlist for months, and some just sounded like something I might want to read. You're often making a split-second decision about whether or not you want a book, so it's really helpful to have a general list (or at least a sense of what will be there) before you go. I preface this section with that information because even with all my research, I still brought home a lot of books that didn't work for me. I read a few chapters of every book pictured in this section before I decided that I didn't want to finish them. Rather than hang on to them "just in case," I wanted to give them to other bloggers who were interested in reading (and possibly reviewing) them. The best part? I gave all but three of these books to bloggers who hadn't been able to attend BEA. I almost did a giveaway with these titles, but I'm glad I ended up giving them to 10 different bloggers instead! Either way, it's hard to ignore the fact that I gave away (without reading) 46% of the books I got at BEA. The majority of books I brought home ended up with someone else. I knew that I'd given away a lot of the books, but I didn't realize quite how many! While I could have held on to them longer and tried again at another time, I didn't want to hoard books that I knew I probably wasn't going to read (and definitely not read before their release date). If I do end up wanting to read one, I can always get it from the library. 5 Stars | Of the 13 books I read, five were 5-star reads. Technically, two were 4.5(ish) but I rounded up for this post. Five out of 13 sounds great, right? Well, it is but I would have read three of these books even if I hadn't gone to BEA. Now, the great thing is that the other two books weren't even on my radar before BEA. Additionally, I haven't heard that much about either title in the blogosphere, so I don't know if I would have read them if it hadn't been for BEA. So, in that respect, BEA was worth it. 4 Stars | Two of the books were 4-star reads, and both were on my wishlist prior to BEA. I love anything about the Civil War, and I'd been dying to read that non-fiction title from the moment I saw it on Edelweiss (months before BEA). The other title was first published in Australia and had been on my wishlist after I saw that one of my favorite Aussie bloggers loved it. Getting both at BEA was great, but I would have read them anyway. 3 Stars | Three books were 3-star reads - okay, but not great. I liked elements from each, but I won't re-read, keep the ARCs or buy finished copies of any of them. Two were some of my most highly-anticipated books from BEA and both received a lot of pre-release buzz. Based on my expectations, both were kind of disappointing reads. The final book was something from an author I'd read previously, and it was about what I expected. 2 Stars | Finally, three of the 13 books were 2-star reads (if that). One was on my list of top 10 books I wanted from BEA, and it ended up being a huge disappointment. One was a book I grabbed randomly and knew almost nothing about when I brought it home. And the final book was by an author I'd been meaning to try and ended up really annoying me. If I try anything by this author in the future, I'll just grab it from the library. There are four books that I haven't read yet but have now been released. One of them was published before BEA and is a finished copy, and I've almost reached my "read or give away" deadline on it. Two came out in August, but the length of one intimidates me and I've dragged my feet on the other for no real reason. The last book just came out a few weeks ago, but it's sitting on my husband's nightstand right now because I think it's something he would enjoy more. If I had to guess, I think I'll only end up reading two of these four (at most). I thought about waiting to do this post in January because that's when these last three books release. But I figured it's a good snapshot of where I'm at today - almost six months after BEA. I plan on reading the two adult titles, so we'll see how I end up feeling about those. I've debated the young adult title since it sounds just a little too weird for me, but I'm hanging on to it for now until I've at least read a few chapters. For me, the answer is no. It sounds crazy to say, and I was shocked when I admitted it to myself. The books were one of the biggest reasons I wanted to attend BEA! When I first got home, I was ecstatic about the books I'd gotten. There were so many anticipated and hyped titles just waiting to be read. But after the BEA glow wore off, I started to feel burdened by all the books. I've never read primarily review books, and I didn't like the impact BEA was having on my reading choices. I kept feeling like I had to read all these books, and I suddenly became way more aware of publication dates. I even created a spreadsheet to keep track of them all - something I'd never done before. For some bloggers, this isn't anything new. If you're used to receiving and reading a lot of review books, I'm not sure you would feel the same. But as someone whose reading taste is all over the place? I felt boxed in by my BEA books! If you're pretty loose on reading and reviewing books before their publication date, you also might not worry about big piles of unread ARCs. For me, it was just too much pressure. I desperately wanted to read the books by a release date because my Type A personality had them organized in order of publication AND saw it as a due date. But that doesn't fit with the way I like to read! I'm more of a mood reader and find it difficult to follow a reading schedule, so the books I got at BEA ended up stressing me out. I did discover two new-to-me authors that are now favorites, but all of the other books I read and enjoyed were ones I was going to read regardless of BEA. As much as I loved the two favorites BEA brought into my life, it's still only two new favorites. Because of that, I'm almost 100% sure I wouldn't attend BEA again. I'd read a lot of posts before BEA about the opportunity for networking with publicists while you're there. I had a few great encounters with publicists, but only one of those led to a new contact that I know was a direct result of BEA. I handed out several business cards, so it may have helped more than I realized, but there's no way to know for sure if those people ended up looking at my blog. Honestly, I felt like it was almost impossible to network. Most of the publicists seemed too busy and overwhelmed to talk, and I didn't want to just randomly hand out business cards to anyone I met. I wanted to use them when I had a great conversation with someone! Maybe I went about it in the wrong way, but BEA was so packed that I'm not sure it's really meant for networking. Are there opportunities to do so? Sure! But I didn't walk away from BEA feeling like that was the purpose of the event (at least for bloggers). I didn't attend any publisher events, however, so I'm speaking only to what it was like on the floor. for the book blogging buddies? YES! My favorite thing about BEA was the chance to hang out with some of my book blogging friends. I don't regret going at all - it was totally worth it to get to meet so many people in one place and at the same time! The things I did outside of BEA and the time I spent with friends is what makes me so glad I went. When I re-read my two posts, I know without a doubt that it was worth it for me to go at least once. I wouldn't trade the time I spent with Betty and Cassie (and so many others!) for anything. I don't know when I'll get the chance to see some of the people I now consider some of my closest friends, so I'd really just go back if it meant spending a weekend hanging out with them. So, would I go back to BEA? I don't think so! It was a once-in-a-lifetime opportunity, and I relished every moment I spent with the friends I've made online. If I lived closer, I might make it more of a priority to attend again next year. For now, however, I plan to just stick to bookish events closer to home. I had an amazing time while I was there, and I'm so thankful I got to go! I get to cross it off my bookish bucket list and set my eyes on something else in the future. This was a very interest insight. I don't think I've seen a post like this before. It's a bold conclusion, especially with all the hype and anticipation this event has, but I think based on your conclusions, you made the right decision. I think I would've felt as overwhelmed as you did with all the review books staring at me. But everything you said are things one must take into consideration before deciding to participate in one if these events. Especially if you have to travel a long way for it. This is really interesting Hannah! Before I talk about the books and such, I will just preface this with..if I wasn't a 90 minute train ride to NYC I don't think I would have gone the 4 years that I have. Truthfully. It kept it relatively low cost for me bc I didn't really have to travel. Since my first year, I've realized it's been about the people for me. The Javits scene overwhelms me tbh and I found myself slowly not caring what books I got (granted..each year I think my outside BEA contacts have gotten better so that could be a factor too?). I really don't think I even go for the books anymore -- it's all about being able to hang out with people for me and attend parties and meet some authors. I find that funny though because mostly everything I thought about BEA before I went was OH THE BOOKS ALL THE BOOKS. The first year I went I brought home wayyy too many books. 70 I think. Which was a lot LESS than most bloggers but still. It was ridiculous. It was all so new and so my eyes were bigger than my stomach so to speak. I KNOW that I didn't even read half of them. And then each year I've slowly come home with less books. I think this year I came home with 20 books but only 5 or 6 of them came from the Javits floor and the rest were from publisher events and stuff like that. Even as I've lowered my number of books it's not like I've achieved BEA TBR zero here. I feel the same as you...I'm a mood reader, I do NOT keep track of when stuff comes out, etc. I feel SOME pressure that I haven't gotten to some of the books this year but honestly I don't feel THAT bad. But it is funny..when you think of the value of what you spent to go and to come home with the books...and then not read them. It makes you pause. So for me, BEA is always like a vacation. A little stressful and intense vacation with the Javits craziness but basically I live for the hanging out with people, meeting favorite authors (UM HELLO JANDY NELSON FOR THE FIRST TIME) and seeing pub contacts and going to events. Is it a good enough reason to actually GO to BEA and spend that kind of money? I don't know. haha. But I know that when it heads to Chicago in the next couple of years I will have to think VERY hard about whether or not I will go. And if I do? It's only because I have friends in Chicago haha. Thought provoking post as usual Hannah! This was really interesting, and I have to say, I agree. I enjoy going to library conferences much more than BEA. Publicists are overwhelmed, and I only have a handful of people I would miss getting to see by not going. I'm not sure if I'll go back or not. I've been thinking about this, too. I brought SO MANY books home from BEA, and it really stressed me out. It was far more books than I could possibly read (13 books for September, when I usually only read 6 books a month). My efforts to review books by their review dates totally fell apart and by the middle of September I wasn't reviewing ANYTHING on time. I still plan to go to BEA next year, but I am definitely going to restrict how many books I bring home. I'd rather get a few books that I REALLY want, try to build some contacts, and just email for other books later, if I still want them. 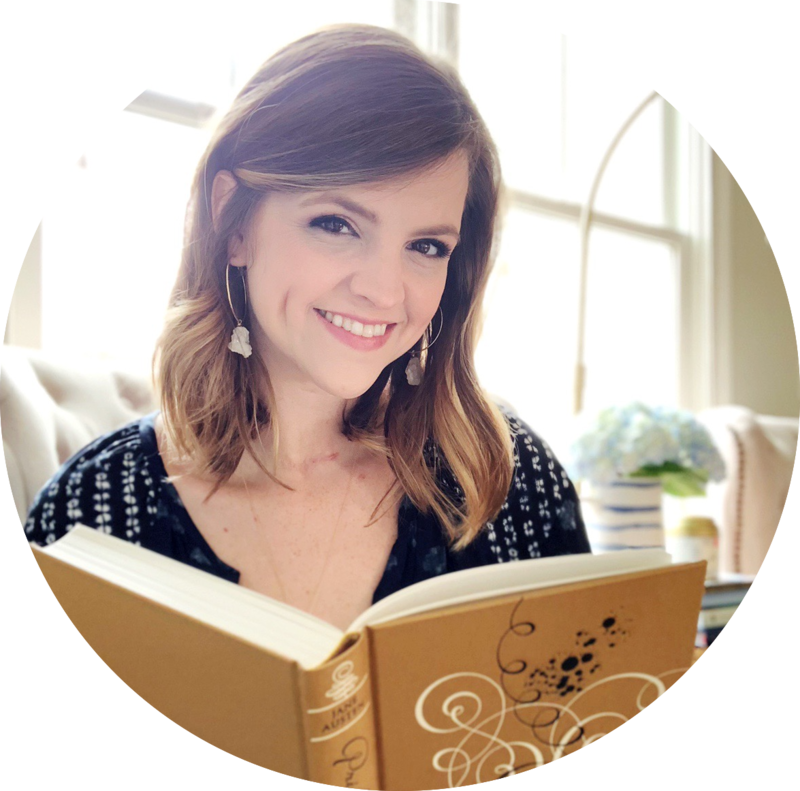 I've always kind of wanted to go to BEA since becoming involved in the book blogging community, but I've always felt unsure about it for many of the reasons you've discussed here. The books are exciting, but even just getting 4 or 5 review books from Net Galley or Edelweiss totally stresses me out, so I can't imagine what a pile of books from BEA would do to me! I would LOVE the chance to meet blogging friends in person but I'm not sure such an expensive event as BEA would be worth it. I love reading this perspective & your honesty! I am on a bit of an unplanned, unofficial blog break, so depending whether or not I come back for real, I'm not sure it would even be a question the next time BEA comes around. But I was more actively blogging the past two BEAs and part of me felt like I was missing out and part of me would feel anxious just LOOKING at all the books other people snagged -- too much pressure! I know review pressure is mostly self-imposed, but I am like you and feel bad if I receive a review book and don't at least try to read/review it -- especially if I requested it/entered a giveaway for it/etc. rather than it showing up unsolicited (which is a rarity for me anyway.) When this year's came around, I already had so many neglected ARCs that I couldn't even fathom taking home one single more! To be honest, I think review pressure is a big factor for me going on a break in the first place -- if I'm not blogging, no one can expect me to review, right? But still there is the guilt! If/when I do come back, I need to block out all ARC/review opportunity stuff and just go with the TBR & buy/borrow new titles I am excited about -- I like being more eclectic and not reading by a schedule, so I can totally understand where you are coming from! I have gone for three years now and I'll go next year but the books and contacts are the least important reason. I go to meet up with friends and use it as a chance to vacation in NYC with my husband. My first year I grabbed ALL the books and felt like you. Totally boxed in and overwhelmed. I'm better at selecting now and have read/reviewed most of them so far. Some haven't been released yet and that's how I'm reading them. My mistake this year was getting a majority of books that were released in September so that was a heavy reading month. I love the way you broke this down! If I didn't live within driving distance I don't think I'd go.... at least not every year. It would be something that I would do once for the experience, but when you evaluate the books and networking..... it isn't always worth it. I noticed that networking was easier in 2013.... I think bc book drops were handled differently. Every time I went to a booth this year, there was something crazy going on and it was pretty impossible to talk to ANYONE. Also, for my reading tastes, the authors at BEA2013 had a bigger wow factor... there were only a couple that I was super excited to see this year, but I had already met them before so it didn't really matter. I think Saturday killed it too... in 2013 that was basically an extra day of BEA-- it wasn't AT ALL like the zoo of 2014. That was a disaster and complete waste of time. For me, I agree... the best part of it all is spending time with friends!! Being a Mama nonstop, I rarely have time to do something that is ALL ME. For the past 2 years, BEA has given me a sense of freedom and a chance to let go of my usual routine! Great post-- I think this will be really helpful to others considering whether or not BEA is something worth attending depending on what their goals are. I felt the same way as you. I went to BEA 2 years ago and got way too many books like you said. I think next year I might go ONLY because I'm a train ride away. For me, it's interesting to go every few years, but like you, I'm not pressed to go every year. That's incredibly insightful. I haven't got to BEA yet and fully plan to either this spring or next spring -- but it was interesting to read about a blogger's insight months after the fact. Kinda makes you wonder about other big events in your life and the way it impacted you down the line. I think I'm in the same boat as you! Honestly, I still have books from BEA 2013 that I haven't read and I always feel so much pressure! Loved this breakdown because I'm sure I'd be shocked to see what I have and haven't read in numbers like that.